It's picnic time in America. With the sun shining high and long in the sky and the weather driving us outside, we're here to share our tips for outdoor eating. Yes, you read that right. We're not suggesting you dress up as your favorite character from Game of Thrones (though we would never discourage it) but a subtle theme can give a picnic a pleasing sense of cohesion. Try focusing on food from a particular country, or base your menu around the sights and sounds of 1880s Vienna. Let your imagination roam free, and use theme-planning to consider other picnic activities, too. The most important part of a picnic is the food, but don't forget to throw in a deck of cards, your latest beach read, or the harmonica you just can't keep from playing. Orange Blossom Honey Lemonade -- Simple. Refreshing. A blast of cool air during the dog days of summer. Chamomile Iced Tea with Raspberries -- A mid-afternoon wake-up, with fruit-forward notes of figs, tart raspberries and chamomile. Ready to let loose? The adults in the crowd will appreciate the hint of sweet in a summer cocktail. Hands will be grabbing for food before you can unfurl your blanket, so avoid having to swat them away by being prepared. Picnics: not a time to construct your most intricate seven-layer salad. Get it done in the kitchen beforehand. Wrap each food item individually, or channel the almighty bento box to give everyone a contained meal. Pro tip: use frozen water balloons to keep food and drinks cool. You avoid the inevitable sogginess of melted ice, and later in the day they make for a good way to expend some energy. OK, so maybe you can't justify using an avocado skin pouch to store your salad dressing. But you can still keep it green by making use of the reusable. We like to minimize trash, at any rate. Go for enamel plates, a lightweight but sturdy alternative to paper, and ditch the plastic and swank up the spread with everyday cutlery from your home kitchen. Remember that when eating outdoors, sealable containers are your friend. Note: we keep finding new uses for our favorite picnic accessories: empty Bee Raw jars. If you portion and pack your meal beforehand you're going to end up with assorted shells, peels and skins. If they're on their way to the compost heap anyway, might as well make them work for it first. Think big and small, practical and purely aesthetic. A hollowed-out watermelon rind? Make a vase for the flowers you brought from your garden, or a bowl for a fruit salad. Orange peels? Throw them in the mix while steeping tea, or use them to add flavor to sangria. Pro Mom tip: Remember the Bug Balm! 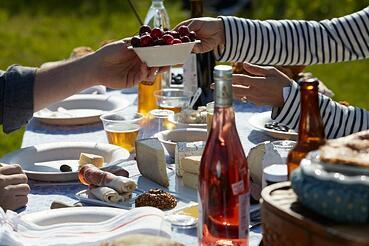 Ants aren't the only pests at a picnic. Keep bugs away the natural way with this balm made of beeswax, organic jojoba oil and naturally insect-repelling essential oils.